This stylish charm features an elaborate beaded pattern, sure to add a striking look to any bracelet styling. A unique blend of metals gives this charm its rosy hue that lends an antique look to this design. The vintage expression ensures it is an elegant addition to any classic charm bracelet. Available online or in-store.This item is a single charm only. Bracelets sold seperately. Styling images may show this charm on a bracelet as styling inspiration. 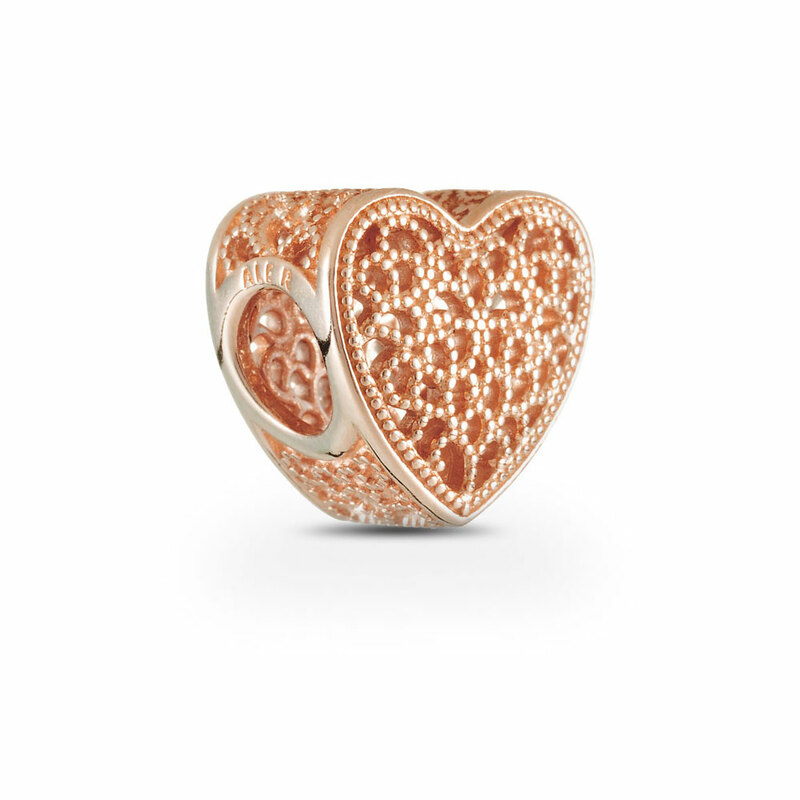 PANDORA Rose Filled with Romance Openwork Charm is rated 4.7 out of 5 by 35. Rated 5 out of 5 by MistyP from Beautiful Rose heart ! In love with this Rose heart, it’s a gift from my husband. Rated 5 out of 5 by ADSEYMOR from Absolutely love the color Decided to match my bracelet to my ring, and I love the way the color pops! Rated 5 out of 5 by Angel Jack from Beautifully made I love it goes nicely with the theme I'm going for! Rated 5 out of 5 by DDon from Looks better than in pics Bought this for my beautiful wife for our one year anniversary. Looks even better live. I will recommend this and needless to say she loves it! Rated 1 out of 5 by s2e1985 from Poor Integrity When I ordered this charm for my wife, I told myself this was the ideal charm, but, when I received it the rose was very very dull, and there was a very slight bend on one side. This charm was a waste of my hard earned money. I was fooled with the pictures on the website. Rated 5 out of 5 by arianaserv from So pretty! Anyone thinking of buying online I would suggest otherwise. I bought theses charms during the buy 2 get 1 free promotion & Online Pandora took the liberty of taking off my free one and charging me for 2 charms and I never got a free one! so if you really like pandora jewelry I would say buy at the store that way you can get the promotions or the deals without any problems.